“Woodshedding” is musician-speak for practicing, especially when working on difficult passages. Woodshedding is the process of isolating a hard section of the music and practicing it until the technical issues are resolved. It is NOT playing a piece at a fast tempo from the beginning to the end at the finished tempo, nor is it mindless repetition. In my years as a teacher, I have found that woodshedding in a detailed, methodical, concentrated way is a struggle for many students. Scientists are confirming what we already know – the brain craves novelty (Pure Novelty Spurs the Brain), and isolating tricky passages and practicing them correctly is the best path to mastery (Effective Practice Skills). When we practice wrong notes, we strengthen those neural pathways and make the mistake more likely to happen again. The first step in fixing a problem is identifying it. As you play through a piece of music, make a pencil mark on difficult sections. The way you mark you music is up to you, but make it obvious, (For more ideas about marking music, please refer to blog articles The Pencil Problem, and Miss It? Mark It. parts 1, 2, and 3. I might be tempted to play these measures over and over again in the same way at the same tempo, but there will probably still be some wrong notes and a lot of frustration. This is the worst way to woodshed. Is woodshedding always a grueling, unpleasant task? No! You can play games to give your brain the novelty and variety it craves. You will save time and reduce frustration too! There are many ways to woodshed. Today’s blog post will focus on one way – changing the articulations. Note: this works best for wind instruments because we use our tongues to articulate. Pianists may not find much use for this game. String players, I’d be interested to hear if this is adaptable for your instruments. If you roll snake eyes (2), play the passage all tongued. If you roll 3, play slurring by two. 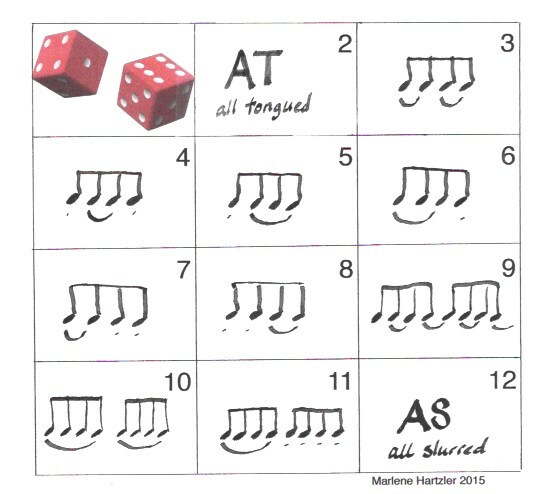 If you roll 9, play the first note articulated and slur by 2 thereafter. And so forth. I’m not the first teacher to come up with the idea of changing the articulation to strengthen facility (many thanks to my teachers Tom Kennedy and Katherine Borst-Jones for showing me how to do this.) However, I hope you will find that it’s useful to see all of the articulations presented in the table above with the game suggestion. This presentation is my own creation. Of course, you should do this exercise at a manageable tempo. The tempo should be quick enough to provide challenge, but there should be very few (if any) wrong notes. Teachers, my students enjoy playing this game in their lessons. I have my students roll the dice when quizzing them on scales, but it is also useful when checking lesson assignments. Many exercises (thirds, chromatic scales, short etudes) are easily adaptable. Playing the Articulation Game will help students learn different slur patterns and will deepen their mastery of the assignments. Another helpful activity is the Rhythm Spinner Game that uses different rhythm patterns for woodshedding. Keep this tool in your woodshedding arsenal. Changing the articulations is one effective way to improve technique on difficult passages, but there are other ways too. Future blog posts on woodshedding will share ideas about how to use the metronome for woodshedding. Love your web site, Marlene! You are amazing.